View this web site in 35 different languages!! How cool is this …. become part of the real life action. Jackie Stewart, a man who inspires and challenges the status quo. One of the most famous family names in motorsports. Denny Hulme the legendary Kiwi F1 Champion. 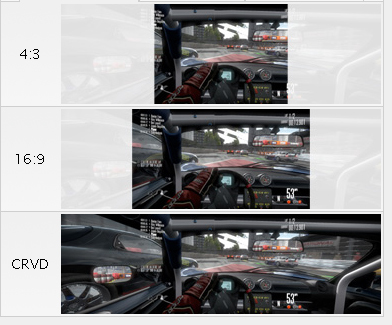 Sim HQ has a wealth of information for the sim racer and motorsports enthusiast. You are going to need a larger desk, racing rig to handle this mazing immersive screen. The 43-inch CRVD™ Curved Display is the world’s first curved desktop monitor, offering vivid LED colors and blazing fast response time. And with a 90° field of view, it doesn’t just expand the screen — it expands your whole experience. CRVD is Ostendo’s revolutionary new scalable technology that allows us to build curved-screen displays that offer unparalleled performance and immersion. The CRVD’s smooth curvature along with its vivid LED colors and blazing fast response time draw the user in and create an experience unlike that of any other monitor. The CRVD monitor can actually be tripled up to have 3 screens placed in the ultimate visual surround mode. Now that might be an over kill for spreadsheets, but for simulation, gaming, visualisation, computer graphics and video production then this added visual real estate is something to die for. Price: $US6499. Excludes local State taxes, freight and for international clients they will face additional customs import costs. This is what you have you’ve missed out on. The CRVD’s ultra-wide 32:10 aspect ratio is 180% wider than 16:9 displays and 240% wider than 4:3, letting you see more of what’s important. Expand your desktop before your eyes. With its roomy 2880-by-900 pixel resolution, the CRVD will expand your desktop and give you extra space to be more productive. Research has shown that wide desktops improve productivity more than 30% compared to a single monitor. The CRVD Monitor has a blistering fast response time of less than .02 milliseconds, so there’s no ghosting in moving images and animation. L. M. Shupp, “The Effects of Curving Large, High-Resolution Displays on User Performance,” Proceedings of Graphics Interface 2006, ACM International Conference Proceeding Series, Vol. 137, pp. 123-30, 2006. G. Robertson, M. Czerwinski, P. Baudisch, B. Meyers, D. Robbins, G. Smith, D. Tan, “The Large-Display User Experience,” IEEE Computer Graphics and Applications, vol. 25, no. 4, pp. 44-51, July/August, 2005. Bruce McIntire on Simdeck PET250 simulator race car brings Scott Dixon’s winning Indy 500 car alive. Allen Taylor on Digital Strategy Version 2 launched by Govt.